The trail ends beneath a thick and prickly holly bush in Rosebank Cemetery. It’s an unmarked grave which seems odd and sad for a man who made such an impact when he was alive. His portrait is in the National Portrait Gallery in Edinburgh, a plaque honours his birthplace in Peebles and, perhaps most importantly of all, his name lives on in the sweet and crunchy apple known as James Grieve. Now the story of a remarkable (but largely forgotten) local hero – a nurseryman who lived and worked in Broughton until his death in September 1924 – is told in the latest issue of Broughton History Society Newsletter. It’s something of a detective story that involved several local people and many trips to Rosebank Cemetary. I picked up the trail after Kate Love suggested the story of James Grieve was worth exploring. 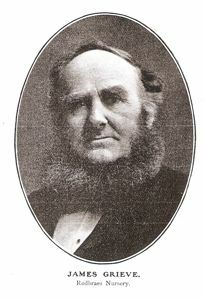 Julian Siann produced invaluable clues in notes prepared by Jennifer Woods of the Royal Caledonian Horticultural Society after visiting the (new) Redbraes Community Garden in 2010. The first few trips to the cemetary came to (sorry but this terrible pun is unavoidable) a dead end. For some reason both Julian and I thought James Grieve would be easy to find. But there was simply no sign of his grave among the fascinating headstones in the older part of the cemetary running along the wall beside Broughton Road. That was until my email to Jamie Reece, Support Officer – Bereavement Services at Mortonhall Crematorium, produced a map and a helpful hint. 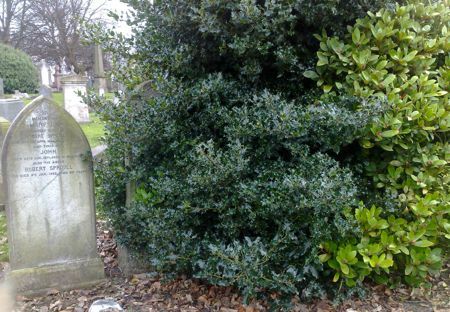 And there it was, surrounded by merchants, candlemakers and shipmasters of Leith, hidden by a holly bush at Section H Grave Plot 76 (according to the cemetery plan). Just to be sure, I sent Jamie a photograph and he confirmed that this was indeed the right spot. No-one knows when or why the nurseryman’s headstone disappeared. But, if cemetary rules permit, perhaps an apple tree would be a better way to honour James Grieve.